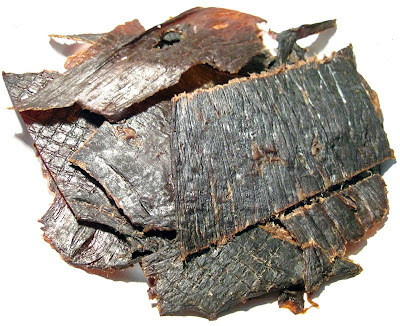 Mingua Beef Jerky is a beef jerky manufacturer based in Paris, KY. The company got started in 1993 when Ronnie Mingua (pronounced Ming-Ghee), a tobacco farmer, bought a Ronco food dehydrator after watching one of those late-night infomercials. A year later and he found himself in business, selling jerky to folks all over the State of Kentucky. Eventually he and his brother built a USDA approved facility and designed their own meat dehydrators, and expanded production. 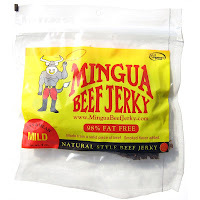 Now, the Minguas rely on beef jerky sales to keep the family going, and are selling it to stores all across the eastern USA. The first thing I taste from the surface of these pieces is a smoky, salty flavor. There's a subtle sweet flavor in there too. The saltiness makes itself more clear as a soy sauce flavor. The chewing flavor evolves into a more defined soy sauce flavor, while the smokiness continues. For being dubbed as a Mild variety, it certainly seems to hold up. I don't find anything hot or spicy in this. However, the saltiness tends to scorch after a few pieces if you don't like salty foods. 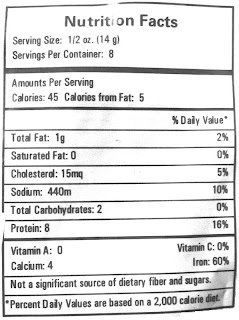 At 880mg of sodium per ounce (440mg per 1/2 ounce according to the label), it's quite high for jerky. The overall flavor of this jerky is the soy sauce, easily the flavor I taste the most throughout. There's a hint of sweet in the flavor, just enough to give it some body and offset the stronger soy sauce somewhat. Aside from that, the smokiness is dominant as well, being easily recognized. The natural meat flavors are light, just enough to add some color to the overall flavor, but not enough to be noticeable on its own. These pieces have small streaks and bits of fat, and here and there I can get a slight fatty flavor mixing into the overall flavor. Overall, what you're going to taste in this is largely a strong soy sauce flavor, and then a well-noticed smoky flavor. This a dry jerky, with a dry surface feel. 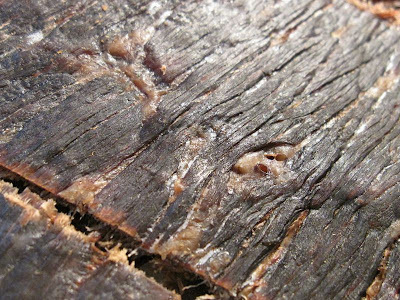 Some pieces are sliced very thin, and as a result chews with a soft, semi-moist feel, but is still a dry jerky. The pieces are very easy to tear apart, and seems easy to chew. The chewing texture starts out feeling stiff, but easily chewable, and quickly chews down to a soft mass in about 10-15 seconds. At that point it feels just like a piece of steak, more close one cooked medium-well. Most of these slabs contain visible streaks and spots of fat, but overall still minimal. Some pieces don't contain anything unchewable and feel like they're pure meat, while others contained some stringy sinews. I didn't encounter any tendon or gristle, however. In terms of clean eating, handling these pieces results in a thin sticky residue, but still clean enough that I can type on my keyboard without getting the keys dirty. Tearing pieces apart drops a few tiny fragments of meat. Mingua Beef Jerky sells this Mild variety from its website at a price of $6.99 for a 4oz package. If you buy four packages, the shipping cost works out to $8.30 (to Southern California), for a total of $36.26. That's effectively $2.27 per ounce. For general jerky snacking purposes, at the $2.27 price per ounce, this jerky seems to provide a fair value. I'm getting a decent amount of snackability from an overall savory flavor, good meat consistency and good chewing texture. Compared to the mass-market brands you find at the grocery store, I think this jerky is slightly better, though I think the $2.27 price per ounce is pushing it. This Mild variety from Mingua Beef Jerky certainly stands up to being mild, but ends up tasting quite salty in exchange. It has a dominant soy sauce flavor, with a well-noticed smokiness, and just a hint of sweet. There's just a slight natural meat flavor with some fatty flavor mixed in. If you like soy sauce, you'll love this jerky. Otherwise, I needed something more complex to excite my tastes, though I still found enough snackability to warrant at least an average rating. The meat consistency and chewing texture is actually pretty good, chewing like a real piece of meat, and still being easy to tear apart and chew. If you compare this Mild variety with the Original variety from the national brands (Oberto, Jack Links, Bridgford), it's clearly a better jerky, with a more savory flavor and better meat consistency. But compared to the Mild and/or Original varieties from other gourmet brands, I find it to be in the middle of the pack. For my recommended beer pairing, go with a lighter tasting ale, like a Pale Ale. Very surprised by the rating of this jerky. It's always been on of my favorites, so comparing this to things like Jack Links is a bit ridiculous. The only arguable con of Mingua Mild is its salty flavor. If you're sensitive to salty foods, you may not like it, and probably most other jerky's. "Good" should be the only rating it receives. In my opinion, the mild is good, but the hot, is the best jerky I have ever tried and I had a 2 bag a day habit until I moved to Florida and couldn't find it!